People watch the launch of Indian Space Research Organization's Polar Satellite Launch Vehicle (PSLV) carrying the satellites in Sriharikota, Indian state of Andhra Pradesh, June 22, 2016. India launched a satellite carrier vehicle, PSLV-C34, with 20 satellites on board and successfully placed them into orbit on Wednesday morning. India on Wednesday launched a carrier rocket with 20 satellites and successfully placed them into orbit, creating a new record for the country’s space programme. Observers noted that in terms of the number of satellites that were carried in and running on a single launch vehicle, India is gradually approaching the world leaders, Russia and the United States. 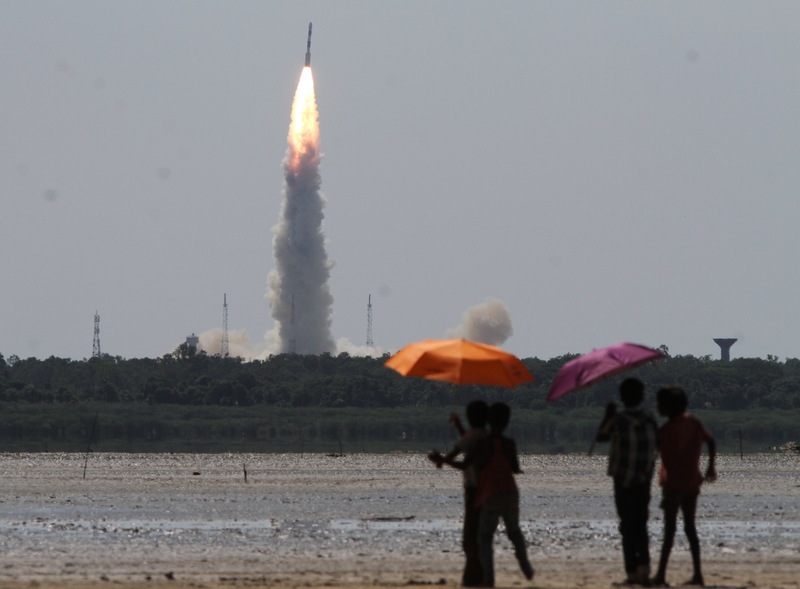 The launch was held on Wednesday morning (June 22) from the Sriharikota spaceport. At the 26th minute of the flight, the PSLV-C34 launch vehicle placed 20 satellites to the preset orbits. These 20 included 17 satellites from foreign customers: the United States, Canada, Germany and Indonesia. The largest of the satellites placed into orbit is the 727-kilogram Indian Cartosat, designed for taking pictures in high resolution. Terra Bella, which is owned by Google, is one of the American satellites. The total weight of the satellites, placed by the Indian rocket into orbit, is 1288 kg. The Indian Government congratulated the scientists and engineers on the successful launch. India’s President Pranab Mukherjee congratulated the ISRO on the successful launch of PSLV-C34, carrying a record 20 satellites in a single mission including the Cartosat-2 series satellite and 19 co-passenger satellites. Prime Minister Narendra Modi said: “20 satellites at once! The space agency continues to explore new frontiers. I heartily congratulate our scientists with this grand achievement. " The local media noted that the successful launch of the C-34 rocket with 20 satellites aboard should increase the customers’ interest in the services of the Indian Space Agency (ISRO - Indian Space Research Organisation). The agency has, as of now, successfully placed into orbit 74 satellites from 20 countries. Its previous best effort was in 2008, when ISRO launched a carrier rocket with ten satellites on board. Within a few years, India has doubled the number of satellites that it can take into orbit by a launch vehicle, gradually approaching the leaders in the space launch industry; Russia and the United States. The record for the largest number of satellites placed into orbit in one launch is by Russia – 37 satellites, followed by the United States, which launched 29 satellites in one go. First published in Russian by Kommersant. Will BRICS join forces in space?